Sara Wood explains how the history of Dunning is entwined with Glebe House - her 5 Star Gold B&B in Perthshire. The residents of the pretty little conservation village of Dunning in Perthshire can recount some fascinating historical stories about the village. With evidence of an Iron Age fort on the hill and a Roman camp in the wood, members of the Glasgow University Archaeology Department are frequent and welcome visitors. If you love, as I do, imagining how people lived throughout the ages, there's much to ponder here with St. Serf's steeple built in 1200 (Serf apparently killed a dragon here! ), the only surviving house from the burning of the village in the 1715 Jacobite Rebellion and the monument to Maggie Walls burnt as a "witch" in 1657. Then in the middle of all these historical sites is Glebe House with its own old stories. Built as the manse to the 1810 rebuilt St. Serf's church, it was commissioned by the then Lord Rollo and completed in 9 months in 1860. It used the same London architects (Messrs Habershon) and had many similar features to Lord Rollo's own mansion just outside the village, Duncrub House, now demolished. 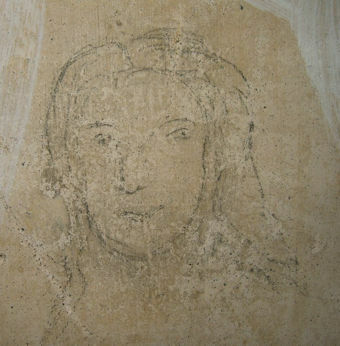 The plastering of the house was done by a Dunning tradesperson and in our renovation of one of the rooms we found a pencil line drawing of a lady on the original plaster. We don't know who she is or who drew her. Another find was in the dining room where we found the signatures of the original decorators from Edinburgh. 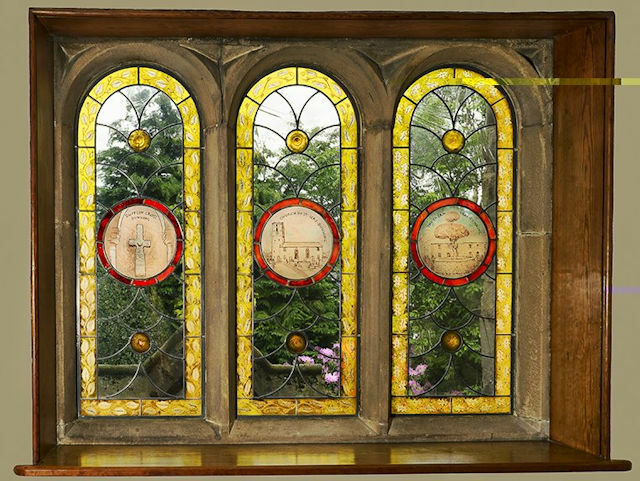 What they didn't do, however, was finish the stained glass panelling in the entrance hallway and stairway which we know from an old Courier newspaper article was supposed to be done in 1862. So, in 2012 we finished the job by commissioning two local artists: for the stairway, Alan Robinson of Ramoyle Glass Studios and for the hallway Lorna Radbourne of Catriona Glass, Dunning. 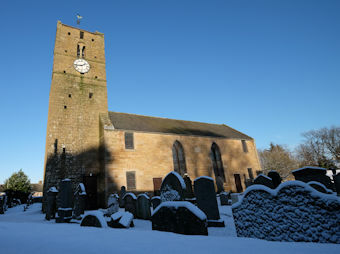 Alan created the rondel images for the stairway panels based on the historic pictures of St. Serfs; the pictish Dupplin Cross now housed in the church and the thorntree planted to commemorate the 1715 burning of the village. 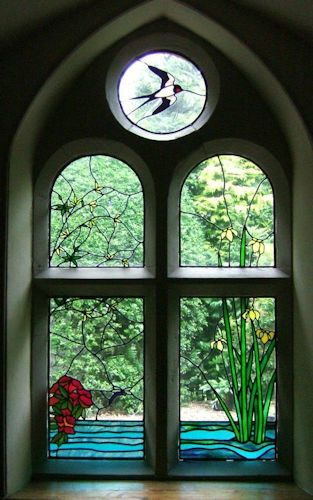 The windows were painstakingly hand-painted using as much original glass as possible and the traditional method of stained glass creation. 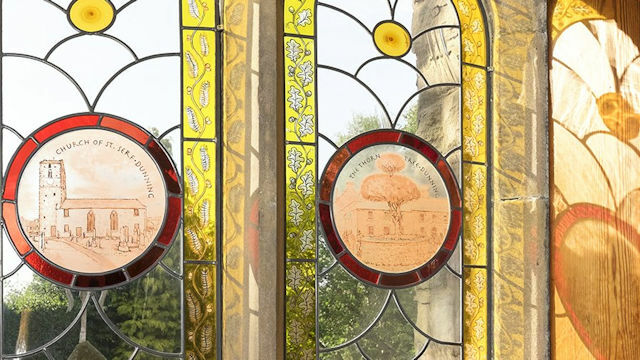 Lorna created a modern depiction of the flowers, trees and pond of the garden which was then inserted into the stone astragals using the traditional methods of the period and backed by modern glass to protect and insulate. So the new meets the old and reflects the varied history of the village.